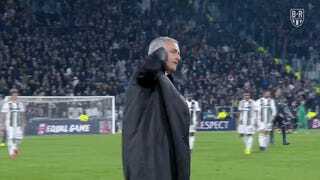 Juventus had little trouble bossing Manchester United in the Champions League today. The Italian team was in control for the vast majority of the match and, if not for some shaky finishing, probably would’ve won with ease. But even during this struggle of a season, United manager José Mourinho proved he can still work his shithouse magic. A penny for Marco Ianni’s thoughts.